Taking up the challenge of the art critic, Jerry Saltz, who called for artists to make affordable artworks in the manner of pieces by Flavin, Hirst and Fontana, the painter Stanley Casselman has made a series of faux Gerhard Richter paintings, which reproduce the character of the ‘Abstract Painting’ series. ‘Red Tape’ exhibits some of these examples alongside new media prints by Hyo Myoung Kim in a show investigating old and new processes for making art. Casselman’s paintings certainly borrow Richter’s method of partially erasing the painted image with the sweeping horizontal strokes of a squeegee across the sticky paint. Layers of colour are revealed through holes appearing out of the dense pigment. 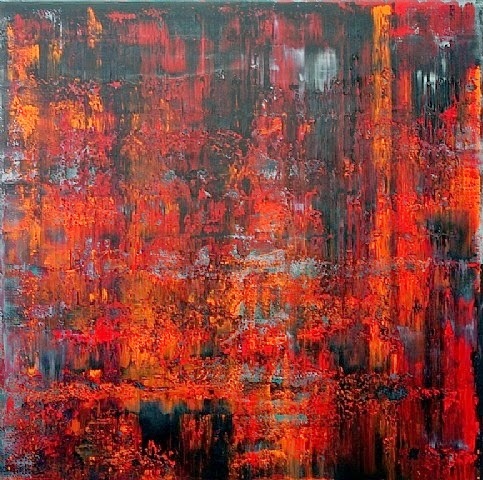 The uncanny similarity is achieved in a faithful re-enactment of Richter’s dialogues between control and chance, construction and destruction. By copying the formal qualities of Richter’s paintings, Casselman consciously resurrects familiar debates concerning originality. Through such mimesis, he discards the conceptual foundations of Richter’s paintings. However, Richter’s paintings largely derive their interest in deconstructing the creative act and leaving a painting hovering between a beginning and a conclusion. Casselman’s work is bereft of enduring interest beyond the skill with which he apes Richter. He can successfully fool the eye like a practised forger, but fails to develop Richter’s more engaging debate about the act of making a painting and its signification. Two of Casselman’s earlier paintings shown here build up an ‘all-over’ effect of smudged points of colour that bleed and blend together to form rich, veils of paint marks. These works from 2011 have an intrinsic logic and coherence missing from the new ‘Inhaling Richter’ series. Hyo Myoung Kim is also exhibiting a series of digital prints illuminated in light boxes in this show and these feel distanced from Casselman’s quixotic interest in copying. These LED light boxes nicely carry that ‘Richtian’ inconclusiveness between action and completion albeit without intention. Thematically, ‘Red Tape’ aims to set up a dialogue between the techniques of painting and new media but this feels rather unsatisfying in the contrast between two very different bodies of work.